The Hunger Games… Where have you heard that before? Me? Many places – with my friends, Netflix commercials or just gossip at the dinner table! Even after hearing about it for so long I haven’t got a chance to read it. Until now! Just a few weeks ago, very recently I moved schools. in my new school library is massive and it is next to impossible to not find a book that you want! For me, I had found Paradise! One day I was just browsing through books in the library trying to find the Land of Stories 6th book. I didn’t find it but I did find something far better – Suzanne Collins – The Hunger Games. I picked it up and borrowed it I’d heard lots of praises for this very book. So why not? I thought, and I picked the book up, went home, and began reading. I promised myself but I’d only read for 15 minutes because I had my exams tomorrow And I had homework. But due to the magic of words coming from Suzanne Collins those 15 minutes somehow turned into one and a half hours. I couldn’t keep the book down until I finished reading it, and here I am now writing a Blog on it. As this book has impressed me far more than any other has. Now look back To All the gossip you’ve heard about The Hunger Games – all the words that come to your mind, all jumbled up. Katniss Everdeen, Peeta Mellark, Gale, President Snow, the arena, Primrose Everdeen. Ring a bell? These are all the starring characters in my new favourite series. This ever-entertaining story is placed in the future where what we know as North America today is under control of a new country called Panem. The capitol which is the centre of Panem and is surrounded by districts which do all the work and live in harsh conditions so that the people in the capitol can access endless luxuries. there were 13 Districts in total before revolution unfolded the districts revolted against the capitol, A huge war broke out and the capitol won as it had far better military and technology than most districts. During the war, District 13 was annihilated. and many other districts like district 12 were left to live in extremely harsh conditions. in district 12 is where our main character Katniss Everdeen lives. District 12’s job is mining and Katniss’s father was killed in an unfortunate mining accident. ever since then, it was Katniss’s responsibility to feed her mother and sister and so she and her friend Gale illegally go hunting every day. A tradition of the capitol is The Hunger Games, in which the capital randomly picks a girl and boy from each district and put them into an arena, where they fight to death and the last one who survives – their district get showered with rewards all year round. 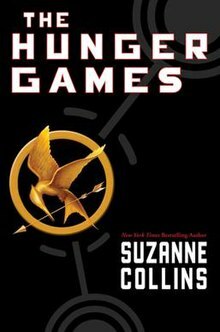 When Katniss’s sister Primrose Everdeen is picked to play The Hunger Games Katniss is outraged and volunteered to take Prim’s place in the hunger games.Peeta Mellark – a boy has secretly had a crush on Katniss is also chosen for the games. Katniss has hated the capitol and the whole idea of using children as entertainment since the day she was born. Now that she is chosen for the games, together she and Peeta might have sparked another revolution. They fight shoulder to shoulder and Peeta tries to express his love for Katniss but he knows that only 1 or none of them can make it out of the arena alive. As you venture into the exciting plot of this book you will be faced with many unexpected turns and twists. And the book will captivate you and entertain you like nothing else has ever before. Previous Post Chased By Your Worst Fear!